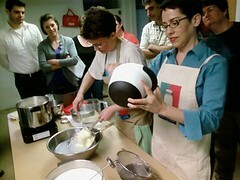 Presenter Holly White, looking suave, and Emily creating a small buttermilk explosion. Photo by Penny Corbett. I think our May 2nd workshop was the best workshop ever that didn’t do what was intended. Thirty people attended – our second-best-attended workshop ever – to see how to make three dairy products from scratch: creme fraiche, butter, and mozzarella cheese. Get the workshop handouts here! 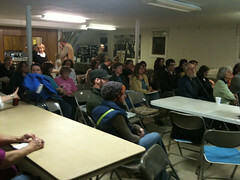 Our presenter, Holly White of the Detroit Zymology Guild, also explained a bit about the two types of buttermilk. The liquid left after you make butter is “true” buttermilk. The kind you buy in the store is “cultured” buttermilk. Both are great in pancakes, but only cultured buttermilk can be used to inoculate other milk to make cultured dairy products like creme fraiche and cheese. Butter made at home by workshop attendee Penny Corbett. Photo by Penny. 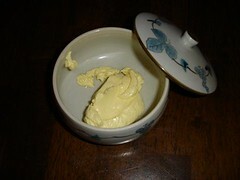 Butter is also quite easy to make at home: just pour cream in a jar and shake. We’ve probably all done this at some point…but Holly explained to us about the importance of “washing” the butter to get all the watery liquid out. Any liquid left in the butter will cause it to spoil more quickly, so you need to press the butter against the sides of a bowl to encourage all the liquid to come out. Rinsing the lump of butter with cold water helps this process, especially early on. It’s easiest to do this if you stop shaking the butter at the “grainy” stage, and before it forms a solid brick. Finally, we moved on to the cheesemaking…and this is where things went a bit awry. We were aiming for mozzarella, but we ended up with ricotta. The ricotta was delicious, though it was disappointing not to get to stretch the mozzarella. We thought the problem might be with the portable butane burners we used – you need to heat the milk very slowly when making mozzarella, and it was hard to keep the burners at a very low flame. I’ve tried 4 more batches with Calder’s “natural” milk, and I get the same result we got on Sunday. I replaced my citric acid, I tested the rennet and I switched to a double boiler. Still got ricotta. I called Calder, and they told me they do low-heat pasteurization. But the problem is certainly their milk. This is exactly what happens when it is overheated- it won’t set and you get those little grains for curds. It’s just that in this case, the overheating happened at the plant. So I switched brands [of pasteurized milk] and it still didn’t work. So going forward, I’m not teaching mozzarella unless I can do it with raw milk. Illegal food workshops, hooray! I called some chef friends for troubleshooting, and found out from one of them that Zingermann’s uses raw milk in their mozzarella workshops. Interesting, huh? And that they also use commercial curds to make their “in-house” cheeses. Holy cow. The fancy-schmancy local creamery uses pre-made curds to make their mozzarella? Interesting, indeed! I intend to have another cheese workshop in a few months featuring cheeses that are less fussy about their milk – paneer, farmer’s cheese, etc. I will test the recipes with readily-available milk products. 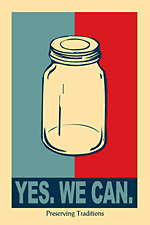 A question for the peanut gallery: If we can’t get commercial pasteurized milk to make a decent cheese, would you rather I used raw milk (which is hard to find and quite expensive) or just not have another cheese workshop at all? The mustard I made with the balsamic vinegar, EVOO and brown mustard seeds TOTALLY ROCKS! The entire family loves it. Since it was already on the spicy side I just took the other odds and ends of spicy and dijon mustards from the refrig, stirred them in, and they are now all consolidated into a fabulous all purpose mustard. I can’t imagine ever buying prepared mustard again, this was so easy and the results were so unexpectedly stupendous! All I can say is that I have made it three times since then and it has become another staple on our table! This is a fave from a retreat site I’ve visited in the past. Just got a newsletter from Cook’s Illustrated that had a video about vinaigrette emulsifiers. They tested mustard, mayo and egg yolk. 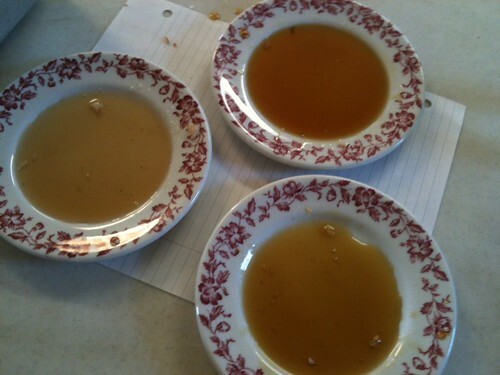 Winner was egg yolk, which caused vinaigrette to stay together for 3 hours (as opposed to mustard – 30 minutes – and mayo – 1.5 hours). They decided, however, that the egg yolk made the vinaigrette too eggy tasting, so they decided a mixture of mayo and mustard was the best solution. Preserving Traditions member Dennis Purcell led us in a great workshop on how to make pasties on April 4th. Here’s the recipe, for anyone who missed it! The dough is similar to pie crust dough, but is a little less flaky and a little more sturdy. You can omit the salt and/or sugar, if you like. Dennis tells us pasties can be filled with almost anything. He likes this mix because it’s not greasy, and has a lot of vegetables to go with the meat. You can omit any item, but you want to end up with about 3/4-1 cup of filling per pasty. Dice all the vegetables to the same size – about 1/4″ – so they cook evenly. Mix the filling in a large bowl with your hands so all ingredients are distributed evenly. Roll out the dough in an oval, about the size of a pie crust. Add up to a cup of the filling on one half of the dough – be sure you don’t over-stuff your pasty, or you won’t be able to seal it shut. You may dot the filling with butter, especially if your meat is lean or if you are making a vegetarian pasty. 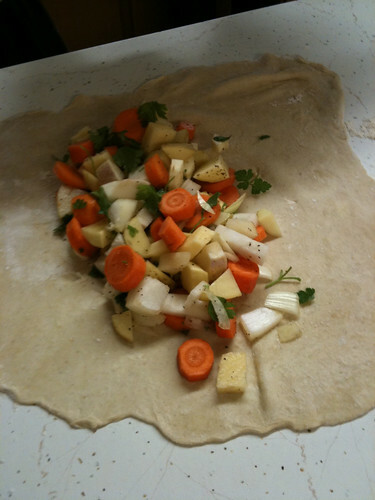 Fold the dough over to make a half-circle shape; fold and crimp the edges to keep the filling sealed in. Slash a couple steam vents in the top and bake on a greased sheet at 375 for about 45 minutes.